Australia offers a wide range of visas, from short term tourist visas to student visas, partnervisas, working holiday visas and long term work visas. If you are thinking of working in Australia see our 'Working in Australia' page or read below about the different types of Australian visas and the requirements you need to meet. Nowadays there is no longer any need to travel to visa offices, in most cases you can apply for all Australian visas online through the website of the Australian Immigration Department. Since December 2013 visa applications are made easier with the new immi-account. Anyone can open an account, and then you can apply for visas, pay online with credit card, upload your documents, check on progress, receive status update alerts etc. This visa is for is for people want to come to Australia for a short holiday as a tourist. An ETA is equivalent to a visa, but there is no stamp or label in your passport and there is no need for you to visit an Australian diplomatic office to submit an application. You can submit applications online and in most cases your ETA Visa will be approved within 24 hours. * You may not work while in Australia. This visa is for people that have family member resident in Australia and want to come to Australia for a short holiday. * Maximum 3 months study. Business ETA (Subclass 977) Visa - is for people want to come to Australia for a short period for business meetings, conventions, conferences; or a short term project requiring a high level of skill and are able to be granted an online electronic visa. Business Short Stay (Subclass 456) Visa - is for people want to come to Australia for a short period for business meetings, conventions, conferences; or a short term project requiring a high level of skill. The Skilled Migration Program is an initiative to help to overcome skill shortages within the Australian workforce and to identify individuals who can bring valuable economic benefits to the Australian economy. If you are a skilled professional, trades person or student graduating from an Australian university, you may qualify for a skilled visa. Skilled Independent Visa - is for people who meet the required points score relying on their own skill, education and employability to satisfy the visa criteria. Skilled Sponsored (Australian Relative) Visa- is for people who have a family member (eg. parent, non-dependent child, brother, sister, aunt or uncle) who is willing to sponsor you. Skilled Regional Sponsored (Australian Relative) Visa - is for people who have a family member (eg. parent, non-dependent child, brother, sister, aunt, uncle, first cousin or grandparent) who is willing to sponsor you. The sponsor must be living in a regional, rural or low population growth area of Australia. Skilled Sponsored (State / Territory) Visa - is for people who can be sponsored by an individual Australian State or Territory Government. The visa addresses very high skill shortages in particular regions of Australia. Skilled Regional Sponsored (State / Territory) Visa - is for people who want to live in a regional area of Australia and can be sponsored by an individual Australian State or Territory Government. The visa addresses very high skill shortages in regional areas of Australia. Skilled Recognised Graduate Visa - is for people who have completed highly regarded international studies related to an industry that the Australian Government deems has very high skills shortages in Australia. Skilled Overseas Student Visa - is for overseas students currently studying (or just completed studying) in Australia that want to remain in Australia. There are other types of Skilled Visas available to people that have not been detailed on the National Visas web site as not many people qualify for the other Skilled Visas. If you would like more information Skilled Visas please contact National Visas. If you are married, engaged to (fiance), or in a de facto (common law) relationship with an Australian citizen, permanent resident may be eligible for a Partner Visa. Spouse (Subclass 820/309) Visa - is for people who are married to an Australian citizen, permanent resident. De Facto (Subclass 820/309) Visa - is for people who are in a common law relationship with an Australian citizen, permanent resident. Fiance - Prospective Spouse (Subclass 300) Visa - is for a fiance who is engaged to an Australian citizen, permanent resident. New Zealand Citizen Family Relationship (461) Visa - this visa allows non-New Zealand citizens to travel to and live in Australia with a New Zealand citizen family member. The Working Holiday Visa gives young people the opportunity to travel around Australia over a 12 month period, with the option of part-time or casual employment. Working Holiday (Subclass 417 / 462) Visa - is for young people wanting to spend 12 months travelling around Australia, with the option of part-time or casual employment. You can check online job portals to see what positions are available and find temporary employment while on your working holiday. If you spend a certain amount of time in remote areas on farms then you might be eligible for a second 12 month visa, normally you can only get this visa once. English Language Course (ELICOS) (Subclass 570) Visa - is for applicants wanting to complete an English Language course. School Sector (Subclass 571) Visa - is for applicants wanting to complete a course of study at primary and secondary schools. Vocational Education and Training Sector (Subclass 572) Visa - is for applicants wanting to study Certificate I, II, III, IV, Diploma, Advanced Diploma and Advanced Certificates. Higher Education Sector (Subclass 573) Visa - is for applicants wanting to study a Bachelors Degree, Graduate Certificate, Graduate Diplomas and Masters by coursework. Masters and Doctorate Sector (Subclass 574) Visa - is for applicants wanting to study a Masters by research and Doctoral Degrees. Skilled Overseas Student (Subclasses 880, 881 and 882) Visa - many students that complete a course of study in Australia may be able apply onshore for Australian Permanent Residency under the Skilled Migration Program. Parent (Subclass 103) Visa - is suitable for a person outside Australia who meets the balance of family test. Aged Parent (Subclass 804) Visa - is suitable for a person in Australia who is old enough to be granted an Australian aged pension and who meets the balance of the family test. Contributory Parent (Subclass 143) Visa - is suitable for a person who meets the balance of the family test and is willing to contribute an extra application fee to cover health costs. The Employer Sponsored Visa could be for you if you have an employer willing to sponsor you to live and work in Australia. Business Sponsored Temporary 457 (Subclass 457) Visa - is available to people who have an offer of sponsorship from a business and are able to work in Australia for a period of up to four years. You need to work in a skilled occupation approved by the government as stated in this list. There are also language, health and character requirements. You must also have and maintain adequate health insurance. A list of these providers are shown on 457 Visa Compared. ENS Sponsored Permanent (Subclass 121/ 856) Visa - enables highly skilled people to be employed by Australian businesses in specific full time positions that cannot be filled by Australian workers or by training Australian workers. The Business Visa Program encourages successful business people to establish or develop a business in Australia. The system allows business people to be initially granted a Temporary Visa for up to four years. When you have established the required level of business or maintained investment activities, you are then entitled to apply for Permanent Residence. If you need to visit Australia for business purposes for a period of less than 3 months the Business Visitor Visa is what you require. Business Owner (Subclass 160 or 163) Visa - is for successful business owners with a legitimate interest in establishing and managing a business in Australia. Senior Executive (Subclass 161 or 164) Visa - is for successful Executives/Managers of major businesses who intend to participate, either as a substantial owner, or in managing a new or existing business in Australia. Investor (Subclass 162 or 165) Visa - is for experienced business investors willing to make a substantial capital investment into an Australian Government approved business activity in Australia. Established Business Owner (Subclass 845) Visa -is for Temporary Visa holders who are owners / part owners in an established and successful business in Australia. 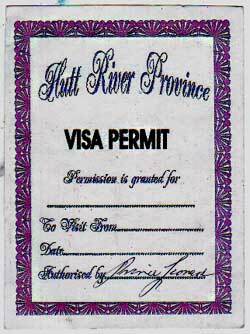 If you plan to visit Prince Leonard's Hutt River Province you can get your visa either at the Geraldton Tourist Information or be issued a visa on arrival in the province. Australia is a pretty safe country and vaccinations are not required, it is free of malaria (pretty amazing as we are surrounded by countries that have it) and there is only the odd case of Denghy Fever or Ross River Fever, for which there is no vaccination anyway. The main things that could damage your health are sunexposure, dehydration, swimming in unsafe places or accidents by not sticking to the road rules (like not driving on the left hand side of the road). You know of any info that we missed or would you like to advertise on this page ? Then contact us!